TV presenter Mairéad Ronan waltzed off with the Glitterball trophy last night as she was crowned the winner of the third series of 'Dancing With The Stars'. In a finale that didn't hold back on the glitz and glamour, Mairéad swept the boards and ended up the favourite with the audience at home. An overwhelmed Mairéad said she didn't think this time last year - when she was pregnant with her daughter Bonnie - she would reign supreme on the dancefloor. 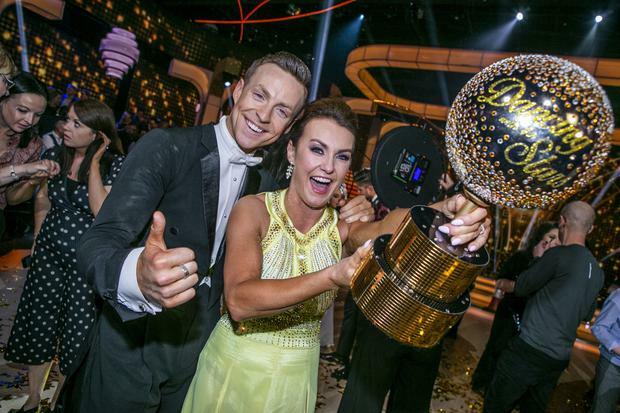 "I was 20-weeks pregnant supporting somebody else, Anna Geary - and I never thought I'd be on this dance floor picking this Glitterball trophy up. "I had never danced in my life unless it was a party so when I told John [Nolan, her professional dance partner] that, he said 'did you not do Irish dancing or stage school? '," added Mairéad. She said it was important to her to always remember who she was before she had become a mother. Mairéad said so many people had told her she shouldn't take on the show but, with the support of husband Louis, she decided to give it a go. "Last year a producer said maybe we will see you next year and I said not a chance, I am 20-weeks pregnant," she said. "They called me at the end of September, I was exclusively breast feeding, heavy and unfit. "Everyone told me not to do it, you should not do it. "My agent said it is gruelling, you don't want to go out and make an eejit of yourself in the first weeks of the show. "My husband backed me and said you have to do it - you made me watch it for a year," she added. John paid tribute to his dance partner saying: "No one deserved it more than Mairéad and she came from absolutely nothing." Meanwhile, it was commiserations for the runners-up, actor Johnny Ward and country singer Cliona Hagan. It was a night to remember too for host Nicky Byrne as he joined his Westlife bandmates for their Irish debut since reforming as a band, performing 'Hello My Love'.